No promises: While sitting in the Denver airport awaiting my journey back to Egypt following the book release event, Sonny sent me a messaging saying his plane was delayed. A couple of gates separated us. We met up and the conversation turned into the possibilities of working on a follow-up to Denvoid. What about a part 2 covering 87-96? I pulled out my laptop and started jotting down notes. Last week I went through a spurt of writing...maybe 10 pages over a couple of days. I'm thinking a similar format to Denvoind, a narrative at the beginning leading into interviews. I haven't picked up a brush yet. 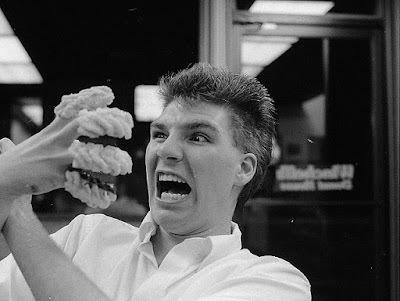 I miss the discipline of posting every Wednesday. Again, no promises. Below might be the beginning of the next Denvoid. Time to make the donuts Funky Cold Medina. Long before people started calling me “Funky Cold Medina” in the late 80s, friends would constantly tell me it was “Time to make the donuts” repeating the infamous Dunkin' Donuts commercial. Far too many times I would up and leave in a middle of a band’s set and head to my night job as a baker at Winchell's. Late Summer or Fall of 1987. To clear up the “Funky Cold Medina” remark, I did encounter Tone Loc outside of a bank in Oakland in the later part of the '90s. A friend pointed him out and I walked up to him and said, “Thanks, thanks a lot!” and walked away never turning back to see his reaction. It probably wasn’t the first time someone bearing the last name Medina walked up to him and razzed him for writing the song. I’m certain every Medina across America suddenly awoke one morning to a new funk-a-fied moniker. Perhaps it was a term of endearment, a way people showed they were hip with the latest rap hit. I’m sure all the Mrs. Robinsons were suddenly branded cougars after Simon and Garfunkel’s hit. I felt their pain. Though it has been over 26 years since the song came out, I still get the occasional Funky Cold shout-out and more recently Mista Dobalina, Mista Bob Dobalina. While researching my boxes for Denvoid, I came across a roll of negatives I never printed. I decided to scan the roll and see what came up. To be honest, I don't recall the day these were taken and I'm fuzzy with the names of the people in the photos. It was a long time ago. 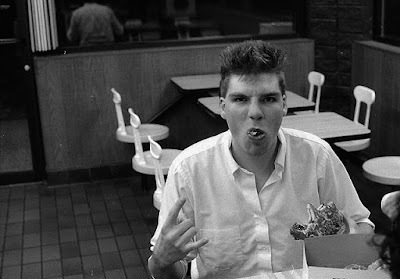 Now that the name nonsense is cleared-up, we'll to move on to the how I got involved in the Donut business. I finally secured a driver’s license right before my 17th birthday. With driving a car comes responsibility and expenses. I needed a job and saw a sign posted in the window of Winchells Donut House across the street from Buckinghan Square mall. I walked in, filled out an application, chatted with the manager and was hired on the spot. It was my lucky day. Since I had the last period of school off, I was given the 2 pm to 10 pm shift 3-nights a week. The duties were light: clean the shop, get everything ready for the baker, and hock donuts that have been sitting in the case since the morning. I probably worked about two solid hours and did goofed off for the other six. At $3.35/hour it was easy money. A friend coming in to curb my boredom. Donuts would be my profession for the remainder of high school into community college. 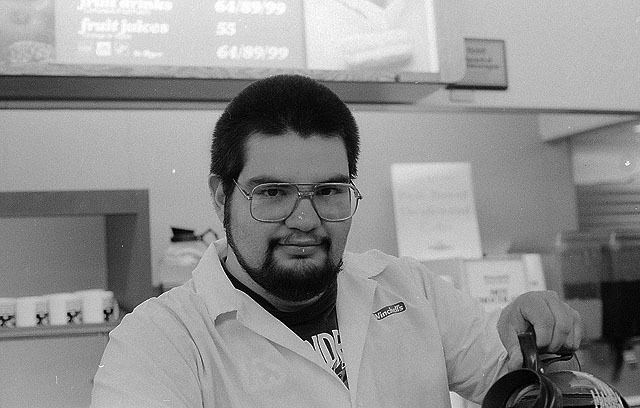 The summer between Junior and Senior year was when I transitioned into a baker to the whopping sum of $4.50 an hour. Of course it meant surrendering weekend nights plus the hours were gnarly; 10 pm-6 am and that is if my replacement showed up on time. The hours cut into my punk rock as far as weekend shows went. I would show up to gigs in my uniform then cut out early to go fry those precious nuggets of dough and deal with drunk and indecisive customers after the bars closed. When you have friends visit you at work. By the time I graduated high school I was putting in 32-40 hours a week, not ideal for someone who was a borderline dropout. I befriended a lesbian coworker couple that dropped hits of LSD at the beginning of their shifts. Both were high school dropouts and a few years older. They were heavily entrenched in 70’s rock music and tried to convince me punk was junk. As gesture to convert me, the pair bought me a ticket to go see a real concert. That show ended up being Stevie Nicks at Red Rocks. The catch was I had to drive the three of us. The pair were super excited the event was being taped for HBO. When I arrived to pick them up, they looked like they walked out of a Fleetwood Mac video. Maybe they were under the impression they would be in a crowd shot. 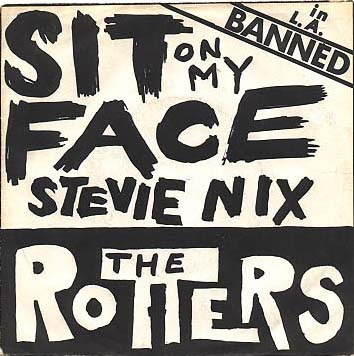 Already one step ahead of them, I had taken a marker and attacked an old white undershirt redrawing the Rotters-Sit On My Face Stevie Nix EP cover. I wore it to the concert, my coworkers giggled and surprisingly several cokehead bikers in the audience praised my Rotters rendition. “Man, I wish Stevie Nicks would sit on my face” was repeatedly thrown in my direction walking up and down the aisles at Red Rocks. There were moments I had to explain the shirt to a suspicious fan, but was usually given thumbs up afterwards. My homemade Stevie Nicks concert shirt looked like this.